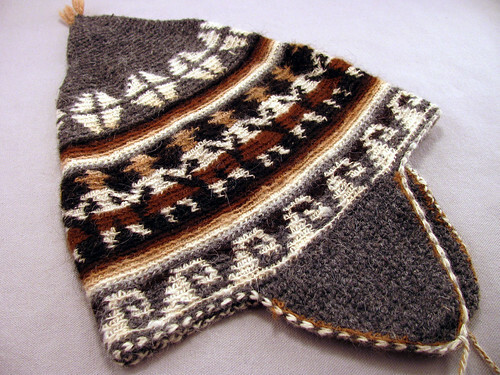 Here are a couple of photos of an original Bolivian hat my sister sent from her time in Bolivia. She was there studying the goats. What exactly about goats I do not know, since I am not as fascinated by goats as she is. She raises and breeds them on a farm near Dallas. She sent the hat for Alex to wear. It is too scratchy to wear without another scull cap under it, so I wouldn’t be surprised if it wasn’t made out of goat hair. He did wear it once. In forth grade he had a new male teacher that let the kids do a lot of the choosing of the curriculum. The kids with the help of the ‘I would rather be screenwriting’ teacher wrote a really weird play about ET bringing Walt Disney back to life. They all believed the rumors that Walt was frozen cryogenically under Disneyland. In one part Alex played that of a Small World figure where he wore the Bolivian hat and a wool poncho my sister also sent. The play made no sense whatsoever. Towards the end the male lead had a fight with the female lead and would no longer perform. Alex took over and performed the rest of part, taking looks at the script stuck in back of a prop on stage. The teacher was impressed that he did that. I had worked in theatre when he was young and Alex spent a lot of time backstage. He took ‘the show must go on’ really seriously even for a forth grade performance. Funny the things kids pick up and the importance they put on them….. Back to the hat, it is done very nicely in tapestry crochet. I love the colors and the boy/girl pattern of which I took a close-up photo. The ear flaps are so big that they reach all the way under the chin so the ties are relatively short. 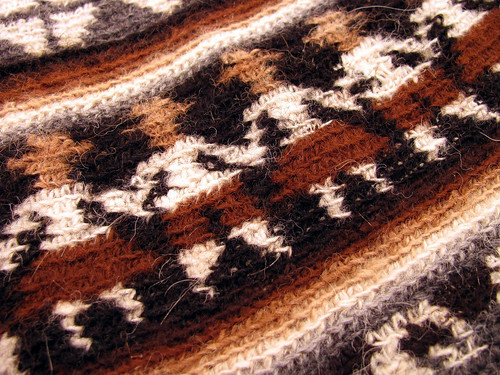 In a softer yarn it would be a nice style to wear on those cold windy mountaintops. This entry was posted on Saturday, January 10th, 2009 at 3:00 am and is filed under Crochet and Life. Tagged: Crochet, Life. You can feed this entry. You can leave a response, or trackback from your own site. It’s very pretty, too bad it’s itchy. Would washing help at all? My son loved his time spent in theatre in school as well. He was on the crew and loved it!